When a will is written, the assumption is that the property contemplated in the will is simply transferred to the beneficiary without any other formalities required. First, the will must go through a probate court depending on where the decedent resided upon his or her death. The executor of the will must petition a court so they may begin the process of locating property, selling property (if necessary), distributing property, etc. If a piece of property in the will is located in another state or in a different country from where the testator resided, then the will may need to be admitted into that foreign state in order for that particular property to be probated. The following compares the normal and foreign will admission processes in Florida. There are various probate procedures for smaller estates that will not go through the “normal probate” processes. These are wills that qualify for Summary Administration and Probate Without Administration (which are discussed in a previous blog post on this website). The “normal probate” process is usually for larger estates with large sums of money and large assets. The process begins when the named executor of the estate petitions a court to be assigned as the representative of the estate. The individuals named as beneficiaries in the will are then given notice of the probate process. Objections to the will and its proposed distribution are permitted at this time. 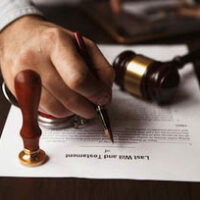 Subsequently, the court will give the executor formal authority to settle the estate. If a will has been executed and admitted in another state court, then Florida will permit the foreign will to be admitted in Florida if it passes the requisite requirements. To admit a foreign will in Florida, the will must be valid under the law of the state or country where it was initially executed. For example, if the will does not necessarily comport with Florida’s state law as relating to formation, the may still possess validity. Nevertheless, holographic wills (handwritten wills) and nuncupative wills (oral will) are generally not valid in the state of Florida. After the court accepts the foreign will as valid under Florida laws, it follows the procedure for a normal in-state will. If the aim of admitting the will is to dispose of real property that is located in Florida, then the scope of the proceeding will be limited to that purpose. Like a normal in-state will, beneficiaries will be given the opportunity file for a revocation of the will if they oppose the probate administration. If you are in the process of filing an in-state or foreign probate petition in Florida, we are here to assist you. The probate process can take months or even years to complete. A knowledgeable attorney can guide you through the process every step of the way. The West Palm Beach attorneys at the Law Offices of Larry E. Bray, P.A. possess years of experience representing families and individuals with their probate needs. We are here to ensure that your interests are fully met.